“Mom, I heard about a new yogurt that I know you are going to be very happy about. The next trip to the grocery store confirmed it is possible to purchase yogurt in glass… Why am I excited about this? It’s simple. I can enjoy one of my favorite dairy products WITHOUT adding to the plastic container burden our planet has been exceedingly forced to carry as more and more plastic is used in goods of all kinds. I wasn’t shy and dug in- pulled back an aluminum foil lid that was securely attached to the glass jar. the wrapper- PLASTIC, the only problem with this product. Not recyclable curbside in my city. Unfortunately, this small item will become part of the waste stream. The glass jars were easily washed. With a little imagination, what fun these will be fun to reuse… to repurpose. A place to show off my grand-daughter’s seashells. The perfect little vase for the flowers she picked for me. An awesome serving container for a garden-grown cherry tomato afternoon snack. Please share your ideas! Leave a comment with your thoughts for reusing/ repurposing the five ounce yogurt jars. This yogurt is as close to homemade and wholesome as a commercially-made product can be. This post is about as close to advertising as I want to get! The following is cut from the Yoplait website. Normally, I would not write a post like this to promote a product, however, I think this one deserves an exception. Every pot of Oui yogurt is crafted to perfection and poured and set in its own glass pot. What does that mean? We pour our simple ingredients like whole milk from cows raised on a diet of only non-GMO feed and real fruit into the pot and leave it to set for eight hours. During this time, the culturing process takes place in each glass pot, and VOILA … milk transforms into a deliciously thick yogurt! Why NOT a glass pot? When we set out to make this exceptional yogurt, we considered every little detail. And that includes the container. Our glass pot is not only recyclable and great for reuse, but it also protects the integrity of the yogurt’s texture during the production and shipping process ensuring our consumers experience the best possible French style yogurt every single time. I am in total agreement with you. Imagine the amount of plastic that could be eliminated from the waste stream if the yogurt industry made a changeover to glass. Before I got to the bottom of your post, I thought “what cute little vases”. Perfect indeed. Fun and purposeful post. Have a nice Saturday. Lovely post, Jane, and like Maggie, I also have a hankering to try this beautiful yogurt! I use a lot of candles in winter to keep heat around the plants we overwinter in our garage. 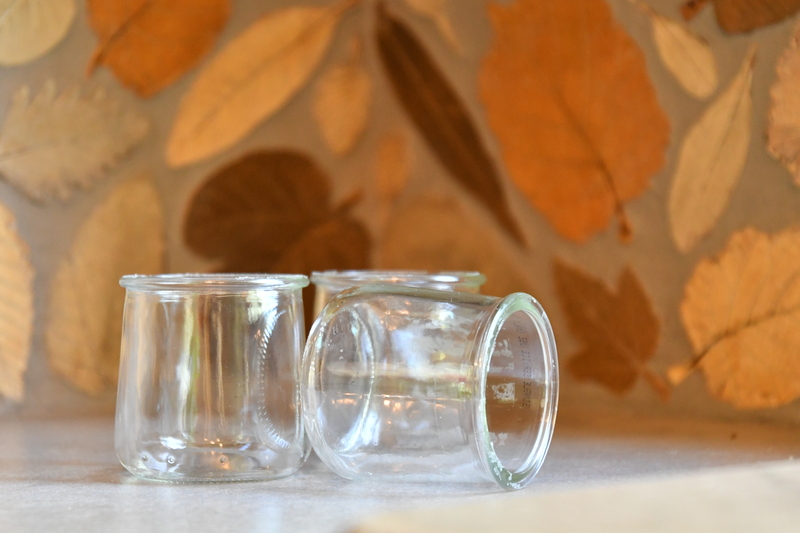 I would use the jars for ‘potted candles’ made from cut tapers set into melted, recycled wax. They would also be sweet containers for individual trifles. Put a votive in each, set in sand, to line a deck or driveway at the holidays. They would also be very nice containers for rooting cuttings on a windowsill. Oh, the possibilities! Super idea for gifting little treats. Now I have a hankering for yogurt! In glass, of course! What are the flowers? I discovered a single little plant in the middle of my yard that had that color of flower. Likely a weed (as most of my yard is), but I’m going to watch it and see what it does. The flowers are asters of some kind. Volunteers that survived being mostly ignored so they aren’t as robust as they were last year. The yogurt is very good.